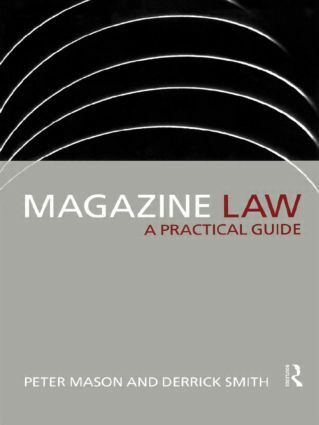 Magazine Law is a comprehensive guide to the law for magazine journalists, editors and managers. Written by a barrister experienced in publishing and copyright law and a former magazine journalist and law lecturer, the book addresses the special needs of the magazine industry and explains the laws that regulate and seek to determine what journalists can and cannot publish, and how these laws are applied in everyday situations. Written specifically for all those in the magazine industry, as well as students of magazine journalism, the authors address issues which directly affect day to day practice. The legal and regulatory framework is illustrated with case studies and up-to-date examples of precedent setting cases. Codes of Practice published by the Press Complaints Commission and National Union of Journalists are set out in appendices, as are requirements for the award of a National Vocational Qualification in Periodical Journalism in Press Law and Ethics. A glossary of legal terms is included.